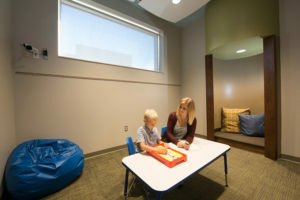 Duluth’s Scottish Rite Clinic is pioneering new ideas in therapeutic design for the treatment of language disorders. 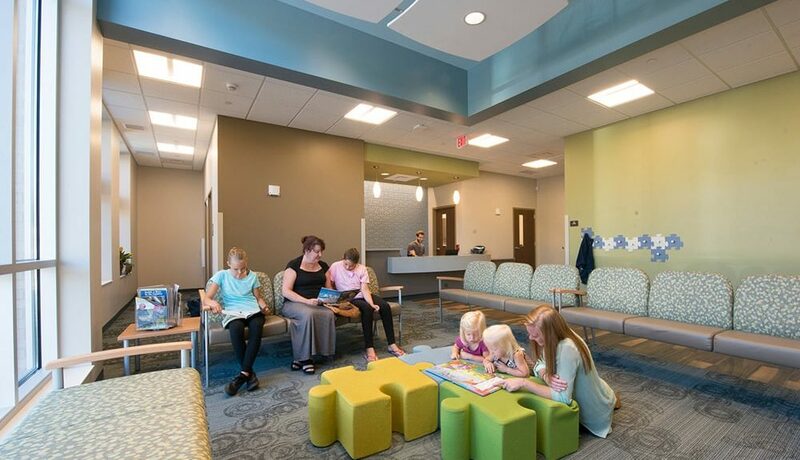 From programming through design, DSGW planned the Clinic with “evidence-based design”—meaning strategies that have been tested and proven to support the work of Speech/Language Pathologists (SLPs). There are two schools of thought on the use of interior color and visual excitement in the treatment of communications disorders. You can keep everything neutral so kids aren’t over-stimulated when they enter their therapy sessions. Or you can introduce the ‘real world’ of colors and action that they will encounter throughout their lives. With the guidance of Scottish Rite Clinic’s Executive Clinical Director, Carol L. Roberts, we achieved a blend of both. Lobby waiting areas and seating nooks are designed as calming places to adapt to the new environment before therapy sessions. Interior hallways are wider than those of many buildings so that children do not feel stressed by crowding or excessive noise and motion. In the eight therapy rooms, windows alternate between five and eight feet off the floor. Children can see streams daylight and the changing sky, yet they cannot look directly outside and become distracted by moving people and cars. 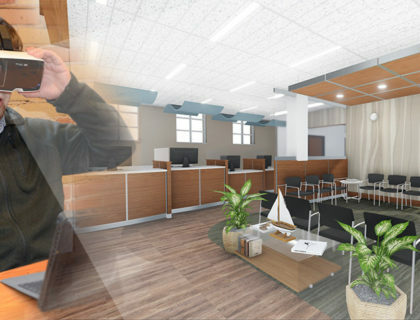 The therapy rooms have high ceilings with floating “acoustic clouds”. This design brings in light while muffling sound to encourage concentration and focus. 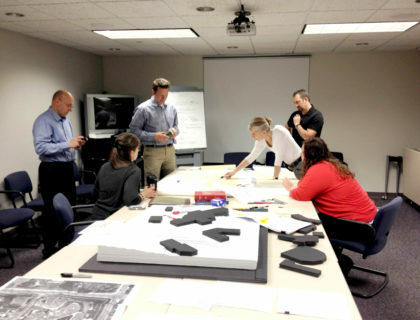 DSGW invited the Clinic’s staff to our office and literally taped out possible shapes for the therapy rooms. We designed each of the eight therapy rooms with the flexibility to be set up as varying environments familiar to children—such an ice cream store, zoo, or Main Street. We introduced the idea of alcoves—small spaces for one-on-one contact. 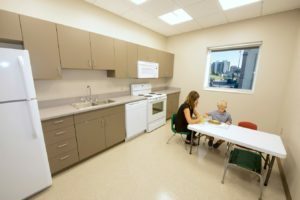 This breakthrough innovation creates spaces for children to take time away from the larger group or to interact with an SLP. 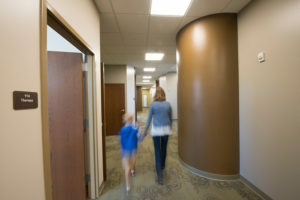 Scottish Rite Clinic is designed for the whole family. The idea is create a stage for learning to communicate with others at the Clinic and then for kids take these lessons home to practice in daily life. Learning how to set a table is one of the many activities practiced in the kitchen. On the second level, we designed a built-in small kitchen and dining area to simulate how to live and communicate at home. Children and their families take part in baking, cooking meals, and sitting down to share them. Guided by SLPs, these sessions are like a “rehearsal” for life at home. The overall effect of the Scottish Rite Clinic can be life-changing. At DSGW, we work with all of our clients to tie the most current research in their field to create simple yet profound solutions through evidence based design.